Our favourite cat, Pink Panther, has made his way to the reels. Known for his chilled out, aristocratic vibes, our furry friend has the starring role in this 5 reel 40 payline progressive jackpot slot from Playtech. To be accurate, there are actually 2 jackpots to this slot. The game features the characters from original cartoon, with Pink Panther himself, Inspector Closeau and Little Man. On top of jackpot payouts, Pink Panther also sports a myriad of bonus features that will keep you more than amused. As usual, before you begin spinning, start by setting your bet. Coin size starts at just £0.01, and then you can choose your Bet per Line, which ranges from 1 to 10. After that, choose the number the Lines you want to bet on, which goes from 1 to 40. This means minimum bet per spin is just £0.01, but if you want to increase your chances of winnings and triggering some of Pink Panther’s amazing bonus features, we do recommend that you bet on more lines. Once your bet is set, you can hit spin, or adjust your Auto Spin settings to sit back a bit. 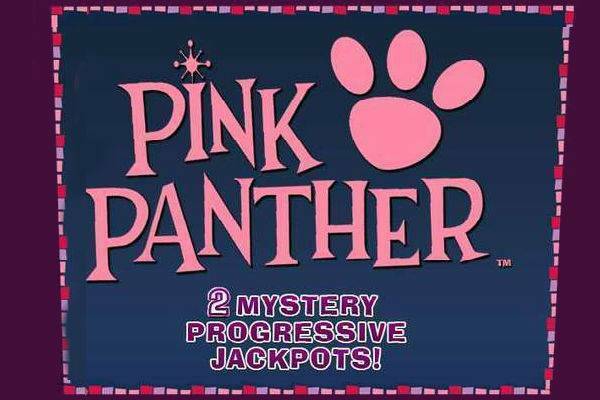 There are 2 progressive jackpots to the Pink Panther slot: Major Pink and Minor Pink. As you’d rightly guess, the Major Pink is the bigger jackpot and usually pays out in the tens of thousands. Minor Pink can still land you a few grand. Both are located inside a jackpot game and in theory, any spin can get you into the game – even a non-winning one. However, Playtech does say that a higher bet will increase your odds of getting into the game. Once you’re in the game, you’re guaranteed a win. You’ll see 12 doors and if you open 5 doors with Pink Panther, then congratulations, the Major Pink jackpot is yours! If you get 4 doors with Inspector Closeau, you’ll take away the Minor Pink. 3 doors with Little Man will get you a consolation prize. Other than the progressive jackpots, Pink Panther has a bunch of bonus features that will tickle you pink. All of them are randomly triggered. Pink Pow: This feature that can happen at any time in your base game. Pink Panther appears on the reels and will start blowing up between 2 to 6 symbols. The exploded symbols turn into Wilds, which can help you make more winning paylines. Crack the Pink Code Bonus: You’ll enter a bonus game with 10 safes. Pink Panther will start opening them to reveal prizes which include free games, multipliers, or an expanding wild on reel 3. If a safe reveals a dynamite, this game will end, but before you go back to your base game, you’ll be awarded with 2 extra free games. Jackpot and bonus games, and the Pink Pow are not included in the free games, but no complaints! The Color Pink Bonus: Little Man will paint numbers in blue, while Pink Panther will paint numbers in pink. Keep your fingers crossed for Pink Panther, because the sum of his pink numbers will be multiplied by your total bet to deliver a cash prize! If you think the numbers could be better, you have the option to Re-paint up to a total of 3 times. Wheel of Pink Bonus: There’s a wheel within a wheel, and Pink Panther will spin for you. The external wheel is all about cash prizes with multipliers to your total bet, while the internal reel has Respin and Collect. Obviously, collect will give you your prize, and then you will go back to the base game. Pink Trail Bonus: Inspector Closeau will follow a random number of footsteps to look for the stolen diamond, and each footstep will reveal a prize that’s multiplied by your bet. At the end of the trail, the Inspector will either collect (which will give you all your prizes and bring you back to your base game) or continue. If you make it to the end of 4 rounds and find the diamond, your overall prize will see an extra 2x multiplier. Gamble: Last but not least, you have the option to gamble every win. You’ll see 5 Pink Panther cards. The dealer will start by revealing the card on the left. You have to choose a card that will be higher than the dealer’s to win. Every time you gamble, you have the option to choose from “Double” (doubles your win), “Gamble Half” (gambling with just half your win so you won’t lose everything), or “Collect” (you collect your money and return to the base game). The Pink Panther slot features the original characters from the cartoon, and the game is cleanly designed. Except for the Pink Pow, all the special features will open new game screens that break away from the reels. It’s definitely visually pleasing, although we were a bit surprised that the music in the slot is rather generic and made us a bit nostalgic for the beloved da-dum da-dum Pink Panther soundtrack. The ever so suave Pink Panther has many fans, Playtech has done an excellent job in turning this all-time favourite cartoon into a slot game. Not only is it visually well done, but there’s also a generous stash of bonus games and 2 progressive jackpots attached. Take Pink Panther out for a spin at one of these top slot sites.